…hopefully soon nearby in a supermarket or shop of your liking. Why don’t you check with teh storemanager ? We refine the pure Slibowitz in a measured, thorough and slow process, adding caramelised sugar and genuine cinnamon. Savour this speciality hot or cold and experience the unique symbiosis of sensual scent and velvety flavour. Aromatic plums and crystal-clear mountain water give the Slibowitz a unique taste. By prudently adding finest honey and soothing ginger, we have composed an all-rounder that pleasures your palate with sensations equally mild and refreshingly spicy. The selected, sun-ripened plums have been distilled with mountain water and the fruity aroma is preserved in every single drop – an exquisite, unique indulgence that will captivate all your senses. We are putting a new spin on the ancient drinking culture – honouring the zeitgeist and transcending boundaries. Indulgence and joie de vivre – to be savoured hot or on ice. Distillery-tradition and solid craftsmanship perfected throughout generations guarantee highest quality in taste, bouquet and wholesomeness. Traditions and values of the craft, the sun of Southern Europe and contemporary innovation bond to create symbiosis – a sensual, velvety, one-of-a-kind flavour adventure. The wonderful combination of authenticity and nature – without additives – creates fine, authentic Schmitzz plum spirits and Schmitzz Liqueurs. Tired of common Gins and bored with Vodka, we set out to find a different kind of spirit, discovering a matured and modern Slibowitz in Belgrade. A whole new world unfolded. Extensive research enabled us to create a contemporary interpretation of spirits. Selected and exquisite types of plum, soaked in the sun’s energy, drunken with purest mountain water, built the foundation of our modern Schmitzz Slibowitz. Our original recipes are a liaison of taste-oriented tradition and Mediterranean temperament. A sheer delight which we very much wish to share with you! 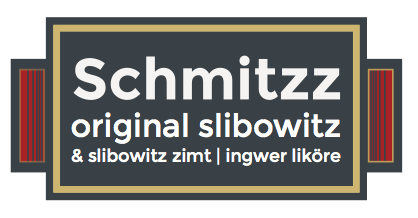 THE ORIGINAL – Schmitzz Slibowitz. Questions ? Remarks ? Let us know !